This classical formula dates back to the early 3rd century, and is considered one of the basic prescriptions for tonifying kidney yang with its plethora of clinical manifestations. Tonifies kidney yang, benefits kidney qi. Tired legs, low backache, lumbar pain, feeling of cold in the waist area, frequent or difficult urination with clear copious urine, abundant expectoration of sputum. Diabetes in the cases mentioned above (additional symptoms may include excess urination, excess thirst). Chronic nephritis with edema (anemia may be present, sometimes there is excess urination, especially at night. Chronic asthma (Deficient Kidney type – not Lung Heat type or Spleen Damp type) which is worse in the winter. Hypothyroidism (symptoms of coldness, myxedema, pale face, tiredness). Sexual dysfunction due to Deficient Kidney Yang. Ascites in cases with Cold in the Kidney. Optic nerve atrophy. 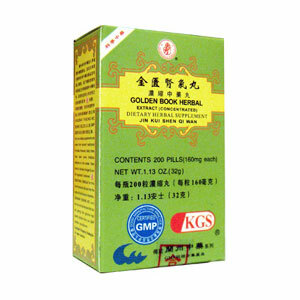 Also useful for yang deficiency causing male impotency, female infertility, chronic prostatitis and lupus. Commonly used as a general tonic. Take 8 pills, 3 times a day. It is common to take this for 6 months or more. Do not take if you are pregnant or nursing. May be too heating in cases with stomach heat or fire. Discontinue use if epigastric pain develops. Discontinue during colds and flu, as tonics tend to drive pathogenic factors into the interior.